eLearning Africa is the Continent’s largest annual gathering of high-level policy makers, decision makers and practitioners from education, business and government. eLearning Africa 2012 is taking place from 23rd to 25th May in Cotonou, Benin. 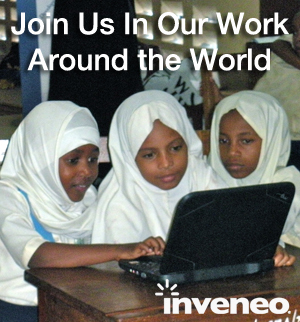 Inveneo is proud to be attending eLearning Africa 2012. Wayan Vota, Senior Director, will be participating in three key sessions: He will be speaking at the pre-conference Ministerial Round Table on the opportunities to use technology to increase the financial sustainability of educational systems. He will be co-leading the eLearning Africa Fail Faire with Leonard Mware, Director ICWE Africa. Fail Faire is dedicated to the embrace and appraisal of failed eLearning experiences. We look forward to robust sharing of different viewpoints on how we understand failure and the lessons that can be drawn from them. Wayan will be on the side promoting teachers as still relevant, if not even more relevant in a quickly changing educational landscape. Be sure to join him in the debate – it is a highlight of eLearning Africa and this year’s discussion will be as lively as ever.